Chronic renal infections are becoming increasingly rare because of the availability of effective antibiotics and early detection and treatment of both acute renal and urinary tract infections and conditions predisposing a patient to chronic infections. 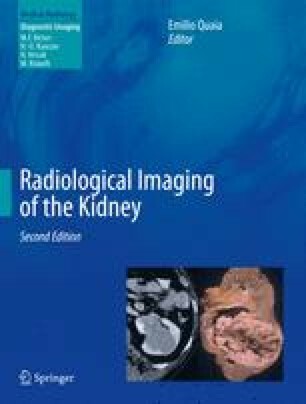 The aim of the present chapter is to illustrate the fundamental imaging features of the different forms of chronic renal infections and the modern imaging of renal tuberculosis with multidetector CT urography. From pathological point of view, the chronic renal infections include two types, interstitial chronic pyelonephritis and granulomatous pyelonephritis, namely, xanthogranulomatous pyelonephritis, malacoplakia, and renal tuberculosis. In this chapter the findings and the role of ultrasonography (US), computed tomography (CT), intravenous excretory urography, and CT urography in the different chronic renal infections are reviewed.